Does being offline necessarily mean being disconnected? Beyond anxieties such as FOMO, being offline is also seen as disengagement from a certain milieu of the digital (read: capital), an impediment to the way life is organised by and around technologies in general. However, being offline is not the exception, as examples of internet shutdown and acts on online censorship illustrate the persistence and often alarming regularity of the offline even for the ‘connected’ sections of the population. State and commercial providers of internet and telecommunication services work in tandem to produce both the “online” and the “offline” - through content censorship, internet regulation, generalised service provision failures, and so on. Further, efforts to prioritise the use of digital technologies for financial transactions, especially since demonetisation, has led to a not-so-subtle equalisation of the ‘online economy’ with the ‘formal economy’; thus recognising the offline as the zones of informality, corruption, and piracy. This contributes to the offline becoming invisible, and in many cases, illegal, rather than being recognised as a condition that necessarily informs what it means to be digital. Who is offline, and is it a choice? The global project of bringing people online has spurred several commendable initiatives in expanding access to digital devices, networks, and content, and often contentious ones such as Free Basics / internet.org, which illustrate the intersectionalities of scale, privilege, and rights that we need to be mindful of when we imagine the offline. Further, the experience of the internet, for a large section of people is often mediated through prior and ongoing experiences of traditional media, and through cultural metaphors and cognitive frames that transcend more practical registers such as consumption and facilitation. How do we approach, study, and represent this disembodied internet – devoid of its hypertext, platforms, devices, it's nuts and bolts, but still tangible through engagement in myriad, personal and often indiscernible ways. 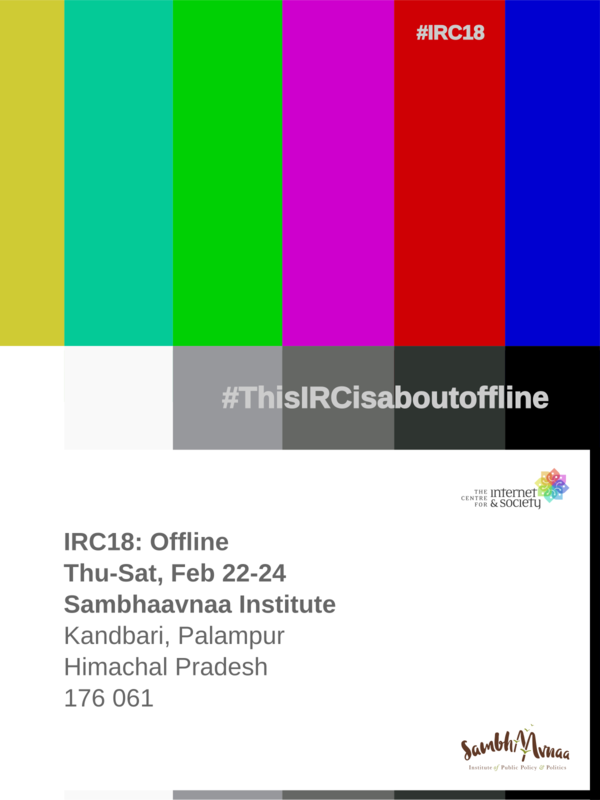 For the third edition of the Internet Researchers’ Conference (IRC18), we invite participants to critically discuss the *offline*. We invite sessions that present or propose academic, applied, creative, or technical works that explore social, economic, cultural, political, infrastructural, or aesthetic dimensions of the *offline*. The first edition of the Internet Researchers' Conference series was held in February 2016. It was hosted by the Centre for Political Studies at Jawaharlal Nehru University, and was supported by the CSCS Digital Innovation Fund. The second Internet Researchers' Conference was organised in partnership with the Centre for Information Technology and Public Policy (CITAPP) at the International Institute of Information Technology Bangalore (IIIT-B) campus on March 03-05, 2017.